So What Do Queer Asians Think of Crazy Rich Asians? 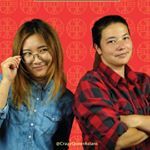 Filmmakers and vloggers Monica Rodman and Ashley Jiang review the groundbreaking romantic comedy. For more on Ashley and Monica, follow them on Instagram! And keep checking back to PRIDE for more Crazy Queer Asians!